Sauces are a wonderful way to add a new twist to favorite meals. Chermoula is a spicy herb marinade or sauce used in Moroccan, Algerian, and Tunisian cuisine. It usually is served over fish, but it can also be used with meat. What better meat for this sauce than lamb? I tweaked my version of Chermoula until the combination of spices was the perfect balance of flavors. It’s super easy to whip together, and you’ll have a tasty dinner in a matter of minutes. I know lamb chops can be a tad pricey, but sometimes you can find them on sale. Paired with chermoula, you’ll have a meal that’s naturally gluten free and paleo. Eating foods this scrumptious is a special treat. Oh, and pair them with flavorful roasted sweet potatoes (yes, many consider sweet potatoes part of a paleo diet). They make an excellent combination. But if you’re following a low-carb way of eating, you may want to serve these lamb chops with your favorite low carb side dish. You will marinate the lamb chops in a little garlic, oil, and oregano. Marinating tenderizes the meat and locks in the juices and the oil prevents the chops from sticking to the broiling pan. 🙂 Let them sit and marinate while mixing together wonderful chermoula sauce. This delicate sauce begins with roughly chopped fresh flat leaf parsley and cilantro. Only use a tablespoon of each for a thin vinaigrette sauce. Toss the greens with chopped shallots. Add roasted ground cumin, coriander, sweet balsamic vinegar, and oil. All those interesting flavors combine to make chermoula’s spicy aromatic taste which certainly enhances the lamb. Cover and refrigerate your sauce while the flavors meld and bloom. Now to the chops. Simply, sprinkle them with salt on both sides and broil for 3-4 minutes on each side for medium-rare. This recipe is incredibly easy. 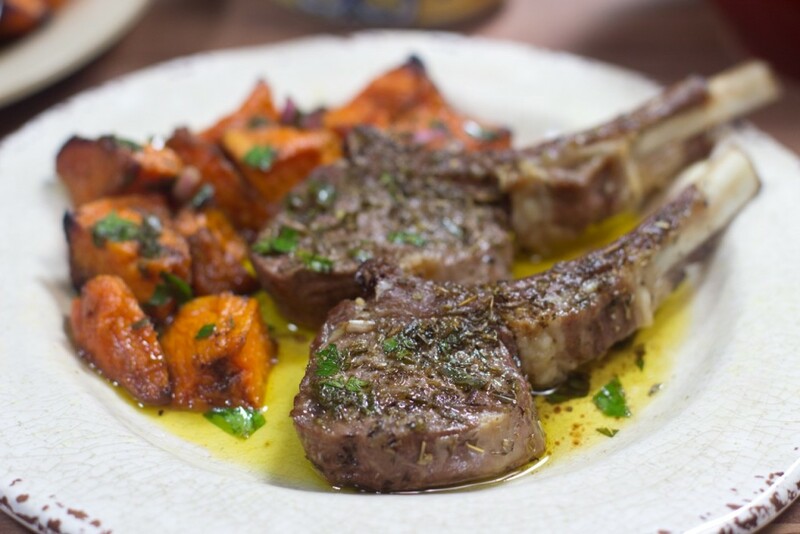 Chermoula sauce elevates tasty lamb chops to irresistible. Go ahead and serve some up tonight. Get the full recipe at The Gluten Free Homestead. If you enjoyed this recipe, you might also enjoy the eBook Dinner for 2 that has more easy and delicious recipes for you to try when cooking for two. Get a free copy here.